We are two weeks into 2010, but this past year still intrigues me. There are some excellent games back there, some of which I still eagerly await to play. In just a few weeks Mass Effect 2 will be released, followed by a glut of titles that will turn my attention away from the gems of yesteryear. I will usher in these new moments with some antagonistic reflections. Let me take one last look into 2009 and answer the question Scott posed at the end of his New Year's post: What are you glad we are leaving behind? Here are a few things that popped up, time and again, in even the best games of 2009, that I hope do not make an appearance this year. When I play a video game, I am agreeing to explore a set of rules put forth by the developer. There is a reasonable expectation that this set of rules follows its own internal logic, and is fair and balanced. When game mechanics deviate from these expectations arbitrarily, they fuel frustration and deliver a steaming pile of dissonance. The most recent example I have encountered has left numerous players flabbergasted. 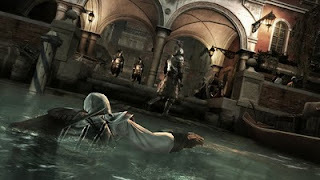 In Assassin's Creed 2, why can no one in Italy swim but Ezio? This is not a game ruining flaw, the ambiance of the game more than makes up for it, but still, the high rate of drowning in Renaissance Italy is absurd. Sure, there is very likely an explanation that involves technical limitations and budget restraints, but would that be a reasonable excuse? Are frequent drownings - on one occasion causing the death of allies - worth the assassin's new-found ability to swim? If constraints were so severe that NPCs would drown the moment they touched water, I would expect the developer to seriously reconsider setting a large portion of the game in Venice, a city literally sinking into the Mediterranean Sea. Other offenders include Resident Evil 5 and Call of Juarez. The jerky control scheme in RE5 consistently infuriates me, yet those undead hordes move with a deadly grace far beyond what their rotting musculature should allow. While CoJ handles fine, the frequent duels with shockingly prescient opponents turn a classic Western climax into an insufferable pain. Mechanical inequality is sloppy at best, and particularly offensive considering how apparent these flaws become over time. Like the judges of Britain's Got Talent, I am a big fan of diversity. I would love to see more non-normative characters in games. Though I am a person of color myself, if a character is compelling enough, I usually relate to a normative protagonist easily. These profile tropes are more egregious when these protagonists lack character. Unfortunately, the number of emotionless stereotypes populating the medium in 2009 has been overwhelming. The ranks of short-haired white-males with stern appearances and vapid behaviors have grown too plentiful. In their ranks I include Ezio of Assassin's Creed 2, Cole of inFamous, Alex of Prototype, and Alec from Red Faction: Guerrilla, just to name a few. There worst trait is not their race, but there blank slate nature. These characters are emotionally empty. They reveal little about themselves and show little evidence of having their own motivations beyond "accomplish this next goal." They commit their actions with no self-reflection, at best showing inconsistent remorse over how many people they have killed. 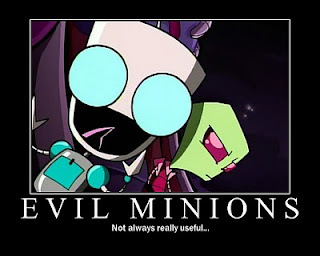 The same can be said for numerous NPCs with little to no personality. As Scott has mentioned on numerous occasions, games like Uncharted 2, Dragon Age: Origins, and Left 4 Dead 2, put these games to shame with their complex and more diverse set of characters. Unless developers are self-aware and tactfully making a statement about the medium, there is no excuse for worlds populated by vacuous automatons. The worst offenders, however, are those we rely on. Whichever brother one might play in Call of Juarez, for example, will inevitably be dragged down by the lunacy of the other. Even Dragon Age, a game I am enjoying immensely right now, is guilty of poor party behavior. While I like the complexity of the tactics slot mechanics, the fact early game allies lack basic combat logic is absurd. Forcing players to invest in more tactics slots, and therefor better AI, is a backwards design decision players should not have to worry about. 2010 will not be the year of miracles. There will be more head-shaven dolts rampaging about inconsistent and unfair worlds. Yet, a short ineffective rant about a year of flaws can be healthy. It allows me to temper my optimism for this year's titles, while also appreciating the efforts of those who seek to enliven the medium and learn from past mistakes. With my aggravations cleared out, I am open for all the successes and failures the future holds. Nice points, especially the blank slate. Non-characters don't "allow you to inhabit them" or somesuch nonsense. They're just plain boring. I'm surprised to see partner AI in Dragon Age come up, however. Not only is it a moot point because you can override the AI and give them orders directly, but if you choose to set tactics either by developing them yourself or by looking them up, the AI is among the most workable in the biz. DA:O is a party-based RPG, the AI is merely a convenience. I mean, is it a problem that you have to give each character commands in Final Fantasy? Well said. Blank slates are not easier to inhabit. How can anyone relate to nothingness. Even Gordon Freeman is too 'blank' for my liking. HL2 works because I can relate to well designed NPCs, not the disembodied camera man. Here's the thing about Dragon Age: I'm probably playing it wrong for two reasons. One, I'm playing it on the PS3, which makes controlling my AI party members a chore relative to PC control. Secondly, I designed a rogue to play as a rogue, not to play as a rogue 1/4 of the time. If I wanted to make all of Alistair's decisions, I would have rolled a warrior. I know what I'm getting into with Final Fantasy. Also, not surprisingly, I didn't really like the gambit system in FFXII. To some extent I think Gordon works a little better than some others is that his range of abilities within the game world precisely correspond to your range of abilities playing the game. He never says "..." and has NPC respond to him. You can't talk back to NPCs, so neither does Gordon. I dislike the blank slate method of character design in general, but I find the purity of their vision impressive. I can totally understand that. I'm a huge fan of party-centric mechanics and tactics, so I was excited when that was the focus. My biggest frustration with Fallout 1 and 2 was that you couldn't control your party members, for instance. In that sense, I'd be inclined to think that a part of your negative reaction is simply a mismatch of expectations. Once I understood that I was really playing one character, and the partners were just window dressing, I was able to have a much better time with the game. I have heard that they tweak the encounter design and balance to be a little friendlier to inhabiting one character for the console versions. Things like sending fewer enemies at you at once and making your characters a little more resilient. It's all anecdotal though, so I can't say for sure if it's true or not. Sounds like it would have been a good idea to open up the tactics controls earlier in the console versions. I think the "blank slate" character problem is the combination of momentum and the general neglect of storytelling. It's seems easy to choose a character for whom you don't have to worry about hair animation. It's also easy and comfortable to fall back on the culturally and ethnically familiar, and when games are made by white men, there's undoubtedly a existent (if not malicious) bias. I also think storytelling and characterization (as well as writing in general) is a lot more difficult and time consuming than most people realize. Even if people set out not to make a blank slate, it's extremely hard to not end up with one. I'd like to belatedly jump on the hate train and say that turret sequences are getting really tiresome. 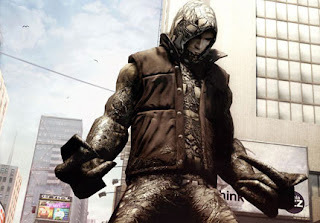 A particularly annoying example is the El Gigante battle in Resident Evil 5. In RE 4, you actually had to fight those things on foot, using the same mechanics used to fight regular zombies. In RE 5, it's just a glorified light-gun sequence. Bah!